Please consider grabbing your coffee, breakfast, lunch, or afternoon pick-me-up at Himalayan Java St. Paul on Friday, May 10! 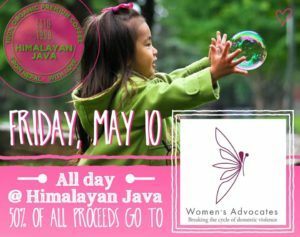 Himalayan Java St. Paul will be donating 50% of all food and beverage sales 7am – 5pm to Women’s Advocates. From Nepal with LOVE 💛 Brewing fair-trade organic arabica coffee from the Himalayas as well as pastries, salads, soups and sandwiches – all with a whole latte love!